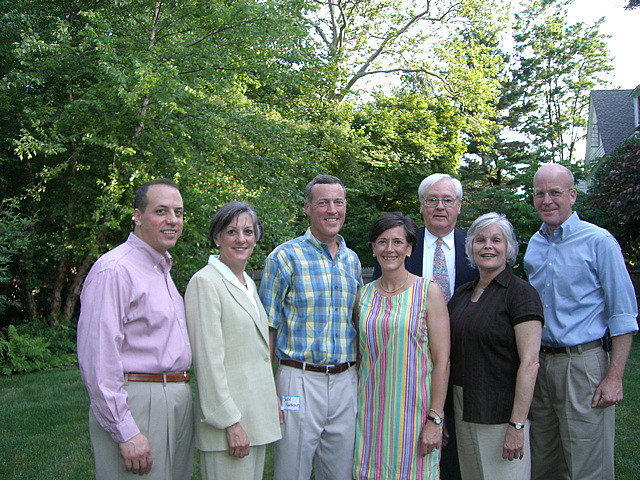 Arkoosh, center, with Schwartz and other Montco luminaries. We have our first candidate in PA-13. Dr. Valerie Arkoosh, a Democratic health care activist and anesthesiologist, has filed a statement of candidacy for Rep. Allyson Schwartz’s congressional seat. Arkoosh is a professor at U Penn and the president of the National Physicians Alliance, which loudly advocated for the Affordable Care Act. She’s been on TV on that subject (Martha Stewart in 2009) and Medicaid (last month on MSNBC). Last week, she headlined a panel at the Pa. Progressive Summit. She’s an active donor, fundraiser, and advocate for women getting involved in politics. Greg Giroux of Bloomberg News caught the FEC filing. It’s another sign that Schwartz is likely to run for Governor and not also Congress. Arkoosh’s husband is Jeffrey Harbison, Schwartz’s current campaign treasurer. He’d know as well as or better than anyone what Schwartz plans to do next year, and under no circumstances is it conceivable that his wife would attempt to primary the Congresswoman. Plus, several Democrats who tell PoliticsPA that Schwartz has called them for support say she ruled out a simultaneous run for Congress. PA-13 is ground zero for top tier Democratic candidates in Pa., so it’s no surprise that so many are chomping at the bit to succeed Schwartz. Here’s PoliticsPA’s list of the 12 names we’re hearing most (including Arkoosh), plus 3 more that surfaced subsequently. State Rep. John Sabatina, named among the 12, has since ruled out a bid. Dr. Arkoosh is an amazing woman; bright, kind, and active. I like that she has a fresh perspective. I wish Daylin would run for US Senate instead of Congress. As much as I love him, I believe that Dr. Arkoosh has a more focused, mainstream voice that the PA House needs to hear. PA-13 will be lucky to have Val. She is intelligent, ethical, practical, committed. Need I say more? Val is a level headed, deeply committed, smart physician who would be a great member of Congress. She is an admitted long shot, but maybe her early announcement will get her name out there. There isn’t going to be a 12 way primary for the congressional seat. Bob Brady is going to enjoy having another minion in Congress as we are going to have the Montco vote split and the Philly machine unified. Crowded Democratic primary with one woman (unless Leanna Washington declares)? I like those odds for Arkoosh. Allyson won’t be able to fundraise for her because she’ll be fundraising for herself. She can’t win, but she can keep Daylin from winning.